Osceola (population approximately 50) is located in the upper west-central portion of Illinois. The small village sits in north-central portion of Stark County in a true country setting. County Roadways 8, 12, and 20 converge in Osceola. Outside of the County Roadways, there are only two other streets in town. Osceola is about 30 miles northwest of Peoria and 7 miles east (and a little south) of Kewanee. A history of the town of Osceola is being sought. It was never officially incorporated as a town or village, but Osceola has been around since the early to mid-1800s. According to a Kewanee Star Courier (www.starcourier.com) newpaper article (September 24, 1982) written by the legendary Bob Westlund and submitted to us by our good friend Marty Golby, Osceola was at one time bustling with activity. In the early 1900s the town supported two churches, an auto repair shop, a general store, a cheese factory, a flour mill, a blacksmith shop, and of course, a school. Today there is approximately 10 houses, a township maintenance building, and an auto parts salvage yard. But the memory of the school at Osceola should live on forever. 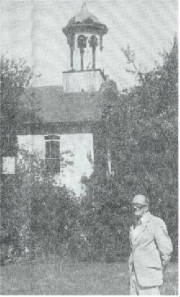 According to the Star Courier article, titled "Hill Was In Last Osceola High School Class", Merwyn Edgar "Hilly" Hill advised that Osceola residents built the school shown above in 1850. The school served the area for just over 100 years. In the late 1800s the school offered a 4-year course of high school curriculum. However the school was open only for three-months in the winter in the late 1800s as the remainder of the year the boys were expected to assist on their farms. Merwyn Hill advised that his father, Eugene Hill, graduated from Osceola High School in the 1890s. Sometime between the time that his father graduated and the time "Hilly" started 1st grade in 1911 the school had become a grades 1 - 9 only school. After students completed their freshman year of study at Osceola, they would continue their education at the nearby schools of Neponset or Kewanee, depending on where they lived. During its "hey day" the Osceola School educated between 40 and 50 kids a year. Grades 1 - 4 attended school on the first floor and grades 5 - 9 occupied the second floor. Each floor had one teacher to fulfill the course of studies. "Hilly" Hill was in the last class of 9th graders to attend Osceola in 1920. He was joined by his sister Marilyn "Hill" Blake, Ruth Gould, and Ione Rapp in that last Osceola High School class. Osceola Grade School maintained an education for children in grades 1 - 8 throughout the next three decades. According to the web address of http://www.genealogytrails.com/ill/stark/BradfordAnniversaryIssue.html#Elmira , the school districts of Osceola and Elmira consolidated in 1952. A new grade school building was built in Elmira, ending the educational use of the Osceola school building. The Osceola school building met an all too familiar demise. It is likely it served in some capacity for a few years after its closure, but that information is not currently available. Over the years the building became overgrown with trees and bushes, making it unusable. 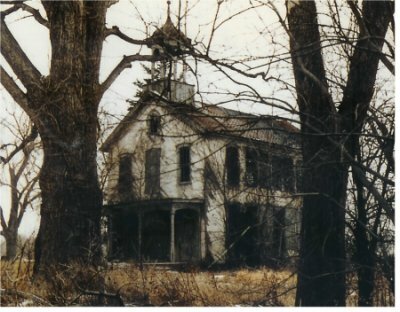 In 1982, after surviving for 132 years, the building was demolished by its owners. Year opened as 4-year HS: 1880s? The Star Courier article does not mention what activities were offered at the school. We can imagine that the school was very alive with the sounds of children at play and everyday learning.